Sullivan's Pond is an artificial lake, and the first body of water in the historic Shubenacadie Canal System that travels from Halifax Harbour, across Nova Scotia, to the Bay of Fundy. After the Shubenacadie Canal System was largely abandoned in the 1860s, Sullivan's Pond fell into disrepair. In the 20th century the City of Dartmouth endeavoured to clean up the various lakes in the Shubenacadie Canal System, in an attempt to live up to its alternate name of "The City of Lakes." 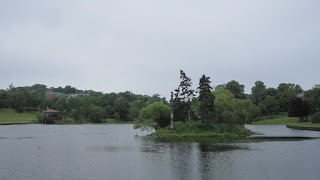 Today Sullivan's Pond is part of a park that includes Sullivan's Pond and the nearby Lake Banook. The most notable feature of Sullivan Pond today is this totem pole on a small island in the centre. The totem pole was a gift from British Columbia to the City of Dartmouth when it hosted the 1969 Canada Summer Games.